The first half of this article presented an overview of serverless computing with AWS Lambda, including building, deploying, and testing AWS Lambda functions in an example Java application. In Part 2, you'll learn how to integrate Lambda functions with an external database, in this case DynamoDB. We'll then use the AWS SDK to invoke Lambda functions from our example Java application. DynamoDB is a NoSQL document store that is hosted by Amazon Web Services (AWS). DynamoDB defines data abstractions as tables, which accept common database operations such as insert, retrieve, query, update, and delete. As with many other NoSQL databases, DynamoDB's schema isn't fixed, so some items in the same table can have fields that others do not. One of DynamoDB's best features is its tiered pricing model. Unlike the AWS Relational Database Service (RDS), in which AWS manages your database using EC2 instances that you pay for, DynamoDB is pay-as-you-go. You pay for the storage you use and the throughput of your queries, but you don't directly pay for any underlying virtual machines. Additionally, AWS gives you a free tier supporting up to 25 GB of space, with enough throughput to execute up to 200 million requests per month. 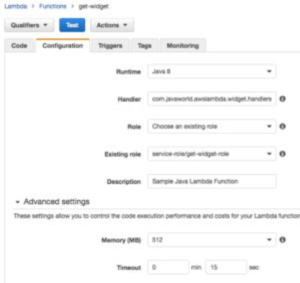 In Serverless computing with AWS Lambda, Part 1, we developed a simple, serverless Java application using Lambda functions. You can download the source code for the GetWidgetHandler application anytime. If you haven't already read Part 1, I suggest familiarizing yourself with the application code and examples from that article before proceeding. Our first step is to setup the DynamoDB database in our AWS console. After that we'll update the get-widget function from Part 1 to retrieve a widget from a DynamoDB table. We'll start by creating the DynamoDB table. From the AWS console, click on Services and choose DynamoDB from the database section, as shown in Figure 1. Once launched, you'll see the DynamoDB dashboard. Click the Create tablebutton to start creating your table, shown in Figure 2. Now you'll see the page shown in Figure 3. Give your table a name (in this case "Widget") and set the primary key to id, leaving it as a String. Pressing Create when you are finished will direct you to the DynamoDB tables page. 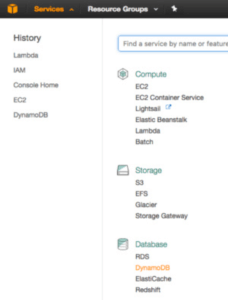 If you need to navigate to this page in the future, select Services-->DynamoDB, and click on Tables. We'll manually create an entry in the new Widget table, so click the Create item button shown in Figure 5. DynamoDB will pre-populate the Create Item page with the id field. Enter an ID that is easy to remember, such as "1". Next, press the plus (+) next to the new ID, adding another field called name. Enter a value for the name field, such as "Widget 1". Press Save when you are finished. With data in our database, the next thing we need to do is update the GetWidgetHandler class from Part 1. We'll start by adding the DynamoDB dependency to our original POM file. The updated pom.xml file is shown in Listing 1. Listing 1 adds the aws-java-sdk-dynamodb dependency to the POM file from Part 1. Listing 2 shows the updated GetWidgetHandler class. The main interface to DynamoDB is the DynamoDB object. In order to create a DynamoDB instance, we need a DynamoDB client. Because our Lambda function will run in AWS, we do not need to provide credentials, so we can use the default client. Note that we'll only be able to query the database without credentials because the get-widget-role from Part 1 has the dynamodb:GetItem permission. From the DynamoDB instance, we can call getTable("Widget") to retrieve a Table instance. Then we can call getItem() on the Table instance, passing it the primary key of the item we want to retrieve. If there is an item with the specified primary key then it will return a valid response; otherwise it will return null. The Item class provides access to the response parameters, so we finish up the implementation by creating a new Widget object with its name loaded from DynamoDB. There are several APIs for querying DynamoDB, from a RESTful service call, to the low-level interface above, to a couple of higher level interfaces. One of the more popular interfaces is DynamoDBMapper. This interface provides a similar construct to what you might find when mapping objects to relational data in a tool like Hibernate. Let's briefly review how to retrieve a Widget from DynamoDB using the DynamoDBMapper API. The first thing that we need to do is add a few annotations to the Widget class, which is shown in Listing 3. The DynamoDBTable annotation specifies the name of the DynamoDB table to which the Widget maps. The DynamoDBHashKey annotation identifies the primary key of the Widget table. And the DynamoDBAttribute annotation identifies other class attributes that map to database attributes in DynamoDB. If you had other attributes that you wanted to ignore, you could add the @DynamoDBIgnore annotation. With the Widget class annotated, we can now update the GetWidgetHandler class to use the DynamoDBMapper, which is shown in Listing 4. In the former (Part 1) version of the GetWidgetHandler we created an AmazonDynamoDB instance, using a AmazonDynamoDBClientBuilder.defaultClient() call. Now we'll use that client to initialize a DynamoDBMapper instance instead. The DynamoDBMapper class provides access to execute queries, load objects by ID, save objects, delete objects, and so forth. In this case, we pass DynamoDBMapper the widget's class (Widget.class) and its primary key. If DynamoDB has a Widget with the specified primary key it will return it; if not it will return null. Rebuild and then re-upload your new JAR file by opening your Lambda function dashboard, then click on the Code tab and press Upload. When you re-upload and subsequently call your function, AWS Lambda will create a new container for the new JAR file and push that to an EC2 instance. You should expect the first run to be slow. If you happen to encounter an OutOfMemoryError when you re-test your function, select the Configuration tab and open the Advanced Settings section. Here you can increase your memory, as shown below. Now that we have a function running in AWS Lambda, we'll write a client application in Java that can call it. 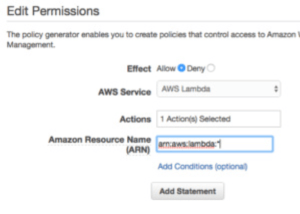 In order to execute a Lambda function from a Java application that isn't running in AWS, we first need to create an IAM user with permissions to invoke the Lambda function. We can then use those credentials from our client application. All of this is easy conceptually, but there are a lot of steps in the AWS console. I'll walk you through them with screenshots. Amazon strongly encourages practicing the Principle of Least Privilege, which means that you should only give users (both console users and API users, which we're creating here) the privileges required to perform their job, and nothing more. This principle minimizes potential damage if user credentials are ever compromised. We don't want to embed our primary user credentials into a Java application, so we're going to create a new user with fewer privileges. Navigate to the AWS console, choose Services, and find IAM under Security, Identity & Compliance. Click on Users and then the Add user button, as shown below. Give your user a name, such as get-widget-lambda-user and check the Programmatic access checkbox and press Next: Permissions, as shown below. Next, click on the Create Group button. While we can add inline policies to users, it is a better practice to create a group that manages policies for you, and then add the user to that group. Enter a name for your group, then click Create policy. We could create a manual policy but to try to make things easier I searched the existing policies first. Unfortunately, the only existing policy for granting lambda:InvokeFunction permissions is the Lambda All Access policy. This basically gives the user root access to all Lambda functionality, which is not a good idea. When you are ready, press Add Statement to add this permission to your policy. Press Next Step to review the policy, as shown here. The last page is important because this is where you can see your access key ID and secret access key. If you press the Show link, it will reveal your secret access key. You'll need to add this information to your Java code in the next section, so be sure to preserve it. Created a new policy allowing the invocation of any Lambda function in your account. Created a group that has this single policy. Created a user and added it to this group. Saved your access key ID and secret access key, which you'll add to your Java code in the next section. Next we'll write the code to connect to AWS and invoke our function. Listing 3 shows the source code for the WidgetLambdaClient class. We begin by creating a BasicAWSCredentials instance with our access key and secret key, which you preserved in Step 2. Our main interface into AWS Lambda is the AWSLambda class, which can be created using the AWSLambdaClientBuilder. We invoke standard() to create it and then we add our user credentials, which we've wrapped in an AWSStaticCredentialsProvider instance. Lambda functions are created in specific regions, so you'll need to set the region. If you aren't sure where you created your Lambda function, navigate back to your Lambda page and look at the ARN in the upper-right side of the page. 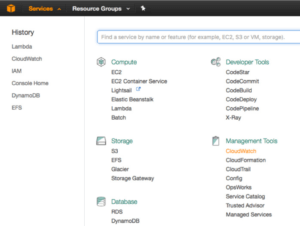 Or you can look at the upper-right side of the top toolbar next to your name on the Lambda page in the AWS console. As an example, I am running in "N. Virginia", which is "us-east-1". Use this website to translate the physical location to the region. Once you've set the region, call build() to create the AWSLambda instance. There are different ways of invoking Lambdas. In this case we'll opt for the most straightforward (and manual) way, of sending an InvokeRequest to the function and receiving an InvokeResult back. To start, create a new InvokeRequest instance, call withFunction() to tell it the name of the function you want to invoke, and then pass the payload you want to send via the withPayload() method. This payload should look just like the one we used for testing in the AWS Lambda dashboard. We pass the InvokeRequest to AWSLambda's invoke() method and it returns an InvokeResult instance. The getStatusCode() method will tell us if it succeeded (returning a 200 response) or failed (returning a non-2xxresponse.) In a production application you should examine the status code after every Lambda invocation and respond accordingly. We can retrieve the body of the response by calling the InvokeResult's getPayload() method, which returns a ByteBuffer. We can convert this to a raw JSON string by converting the ByteBuffer to an array, by calling its array() method, and then passing that array to the String's constructor. If we wanted to convert this into an object, we could use a tool like Jackson or Gson to deserialize the JSON into an object. From the Services menu, choose CloudWatch, under Management Tools, as shown in Figure 18. Select Logs from the left panel and then choose the aws/lambda/get-widgetlog group. Accessing logs through your Lambda page will automatically filter to your Lambda's filter group, but regardless of how you got there, you should see something similar to Figure 19. Each Log Stream represents the periodic rollup of logs for a specific Lamdba. You can click on one of the entries to see the contents of the log; for example, I updated the client to request the Widget with ID "2", which does not exist. Figure 20 shows the contents of the logs for that execution. In this example you can see a successful execution (start and end without any custom logging) followed by an error ("No widget found with ID: 2"). Logs are a good tool to help you troubleshoot Lambdas, especially ones executed asynchronously. This two-part tutorial has introduced you to serverless computing with AWS Lambda. In Part 1 we answered the question, "What is serverless computing, anyway?" and I explained the relationship between serverless computing, microservices, and nanoservices architectures. You got your first look at AWS Lambda and we built, deployed, and tested our first Lambda function in Java. In Part 2, we've added support for Amazon's DynamoDB, enabling our Lambda function to retrieve a live Widget from DynamoDB instead of creating one on-the-fly. You learned how to interact with DynamoDB using the DynamoDBMapper API. 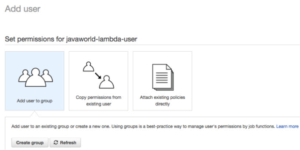 We created a Java client application that could invoke our Lambda function, and you learned how to create a new IAM user, group, and custom policy. Finally, we built the updated Lambda function and reviewed logs captured and sent to CloudWatch for troubleshooting. Check out this FREE AWS IaaS Solutions eBook!